While coming through Boston, Swedish percussionist Markku Reinikaninen stopped by to visit us. 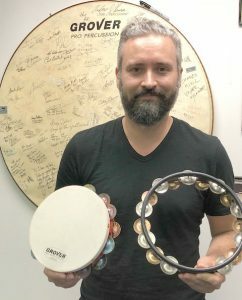 Markku specifically was interested in picking up a couple of tambourines that he could use in his studio recording sessions. While he already had a few Grovers, Markku was very interested in obtaining one of our Studio Pro headless models. Markku ended up with two new tambourines, model T2/GsPh-H, a headless German Silver / Phosphor Bronze combo, and, one of our T2/HS Hybrid Silver headed models.